If not disposed of correctly, plasterboard can release hydrogen sulphide gas, which is toxic. In order to prevent this, we offer a number of different options to allow you to dispose of sheets of plasterboard and off-cuts. 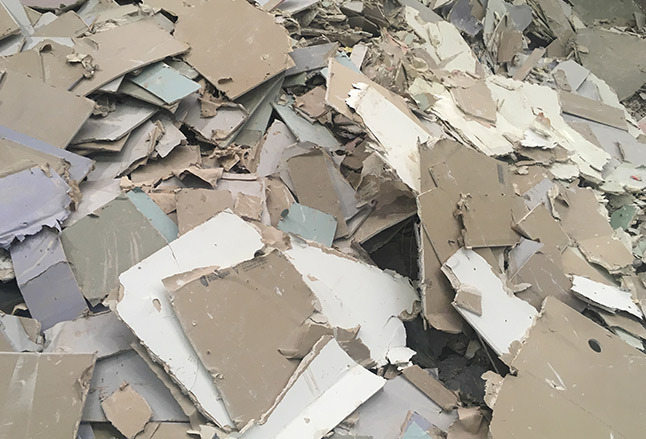 The best option will depend on the quantity of plasterboard you need to dispose of, read the options below or contact us today for further advice. We offer three options for plasterboard disposal. Purchase polypropylene sack(s) alongside your general waste hire skip. These measure 26 inches by 45 inches (66cm by 114cm) and are approximately 98 litres in volume. These cost £10 + VAT each and will be delivered with your skip or they can be collected from our office. Once filled with plasterboard waste, place the bag securely in the skip at the top and we will recycle the plasterboard accordingly. Bring plasterboard waste directly to our yard. We accept deliveries of plasterboard waste directly at our site in Rackheath. We do require you to wear safety footwear on site and we can loan you a high-vis and hard hat if you do not have these items. Please call our office before your visit for pricing and more information. Please note this service is only available for plasterboard waste and we do not accept mixed loads of waste delivered to site. Hire a skip specifically for plasterboard waste. Due to the specialist nature of our plasterboard skips, we are unable to currently offer booking for these online. Should you wish to make a booking, please call us today on 01603 721533. Alternatively, you can use our contact form at the bottom of the page and we will get back to you as soon as possible. Due to the specialist nature of our plasterboard skips, we are unable to currently offer booking for these online. Should you wish to make a booking, please call us today on 01603 721533. Our team will discuss your specific needs and arrange your skip accordingly. Alternatively you can use our contact form at the bottom of the page and we will get back to you as soon as possible. This skip is available in all sizes and is solely for the disposal of plasterboard waste. As leading hire skip suppliers in Norwich, we take our responsibility to dispose of plasterboard and other hard to dispose of material seriously. It is the gypsum content in plasterboard that causes the health and environmental risks if not disposed of correctly. Therefore, lime-based plaster does not require specialist precautions and can be put into general waste skips. If you’re unsure, please contact us. If you are searching for a plasterboard skip in Norwich, we can arrange to deliver one directly to your site using our reliable delivery team. If you are searching for a skip to hire, but you are unsure which type skip to choose our team can help. Established in 1985 and still family owned and managed, our expert team will be able to answer any queries you have regarding your skip hire. If, in the unlikely case, we are unable to help you, thanks to our extensive connections in the industry, we are sure to be able to recommend the best route for your waste disposal.